Eli Manning during last night's game. ELI MANNING ONLY touched the ball seven times in the first pre-season game of the fledgling NFL campaign but he still managed to fumble the football despite such limited opportunities. The New York Giants quarterback has had 80 regular season fumbles in his 10-year NFL career – his brother Peyton has 70 in 16 years – and this latest one came despite the Hall of Fame game in Canton, Ohio being a glorified scrimmage played at 2/3 speed. Email “Eli Manning is fumbling footballs again - the NFL must be (nearly) back”. 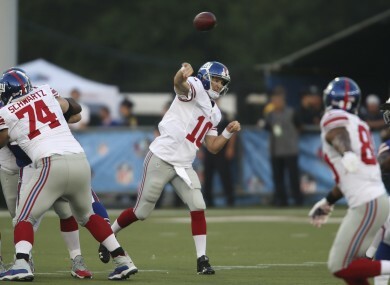 Feedback on “Eli Manning is fumbling footballs again - the NFL must be (nearly) back”.